BRAND NEW 97-00 Dodge Avenger Dual Halo LED Chrome Projector Headlights + Day Time Running Chrome LED Fog Lights! 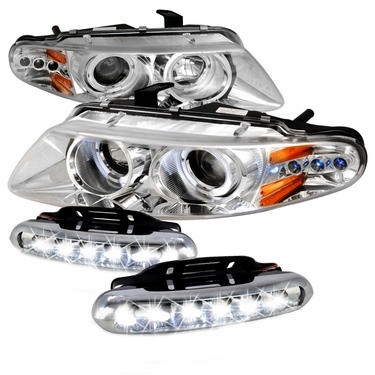 1997-2000 Dodge Avenger halo projector headlights now come with LED for the corners. The LED corners are innovative and change the way the headlights look drastically. The lights are made to be luminescent so that it causes a beautiful glow during the day and the night. The Avenger factory headlights (OEM) do not give the same innovative look and cost much more than these chrome projector headlights. The Dodge projector headlights are at a great price for both driver and passenger sides. Make your move now to change what you Avenger needs.